This business card for Orville C. Brown, "agent for the town of Osawatomie, Kansas Territory," accompaned a list of the advantages of settling in Kansas Territory and the city of Osawatomie. 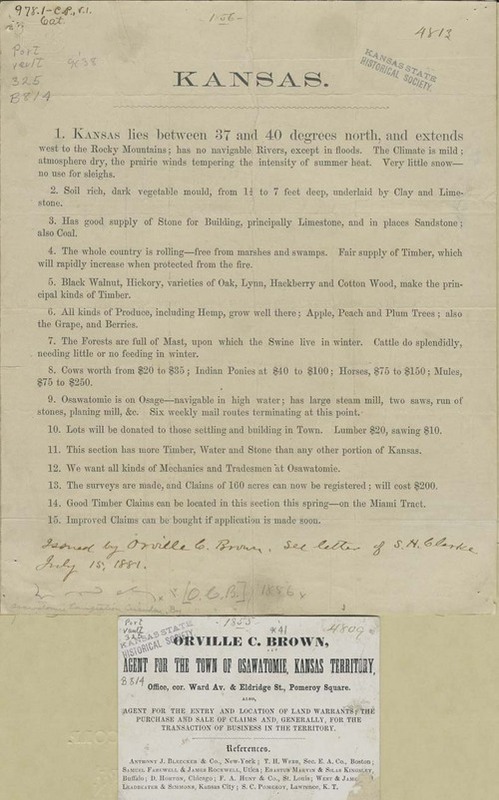 A hand written note on the list indicated it was issued by O. C. Brown. The printed circular described the soil, available building materials, wood, produce and opportunities for acquiring land. It also gave the price of various livestock. The business card noted that Brown also was involved in locating land warrants and purchasing and selling claims. People - Notable Kansans - Brown, Orville C.